10I am the LORD All-Powerful, and I challenge you to put me to the test. Bring the entire ten percent into the storehouse, so there will be food in my house. Then I will open the windows of heaven and flood you with blessing after blessing. 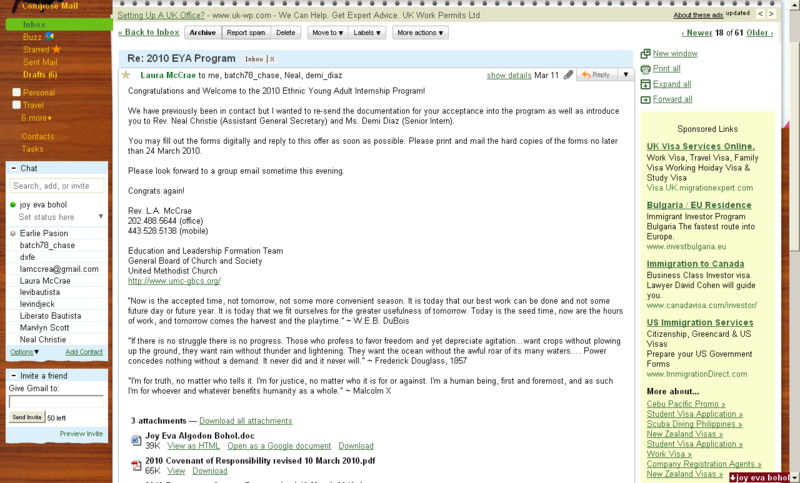 Days before I ended my deadline (agreement) with God’s will to my future (after April 2010) an e-mail from the program I applied on December 2009 flashed on my gmail account (see above photo). It was God’s answer to one of my prayers. I got in! I was chosen as one of the 12 delegates/students from the international applicants to join the Ethnic Young Adult Summer Internship Program in Washington District of Columbia (hahaha…At last I remembered what D.C. means!) The venue for the event is part of the package but that’s not what I was excited for. The program itself dealing with public policy, social justice, and social change made me most eager to be a part of this life changing and contagious movement to be movers in our own ethnicity! I’ll be sharing with you my application video to EYA. As much as possible I keep a list of prayer requests, answered prayers, and surprised blessings with me to help me see how wonderful God is in times of my sorrows. Sometimes, when the cloud of worry and disappointment cover our sun (God), it is hard to climb out of it. But looking at how majestic my Savior is (as I look into the list), my heart would jump in joy and see light coming out from the rain. Writing about what happened to me made me see that my life now is way beyond what I imagined myself a decade back. I was never an outstanding student, never received honors or attended press conferences (since my teachers would not allow me–only those honor students). I was an average kid. Playing tag race with boys and never went with my girl classmates (who only occupy themselves with make-up, outfits, and sharing their crushes names and stuff). But one thing I am proud of looking back was my involvement with public service through Girl Scouts (which further became one of my endured commitment until high school) and the love to share Christ to others. Back then I was never chosen to travel and join competitions. So traveling was limited to me. Not until I reached high school (still I was never even an option to be a representative in any school and invitational events–except for Karatedo). I got hooked to extra-curricular activities (outside school) like Karatedo, the United Methodist Youth Fellowship in the Philippines, Habitat for Humanity, Ramon Aboitiz Foundation Inc. Kool Adventure Camp, etc. My involvement in these areas opened my eyes to reality (poverty, lack of education, government, etc.) and has earned me social values and eagerness to participate in social issues. When I was in college (17), I was the Visayas representative to the National Bible Quiz in Manila (my first time to go there and to ride an airplane). But I didn’t win (sorry to disappoint you! hehehe…). And on with the 2007 TeenStreet Malaysia where I got to be one of the Philippine delegates to visit Singapore (one day–our transit to Malaysia) and Malaysia (10 days). Then in 2009 I was one of the six Philippine Youth Ambassadors of Goodwill to South Korea (everything sponsored by the Korean government). With such surprises and blessings I received, thanking God every second is not even enough. With my overflowing joy, sharing these blessings to others and inspire them to make a difference in their community and even the whole nation, inspires me to explore more opportunities and tell others about it. You! Yes, you who’s reading my blog. If you have the heart to be the change of this nation and is willing to go beyond the status quo, see this link (youth.net.ph). This is where opportunities to serve your motherland is provided. This website is recognized by the Philippine President and the National Youth Commission. If we persevere to pray (plus good intention) God in His own time will answer it. I am a living testimony to God’s answer, which is neither to early nor too late—it’s always on time. God always answer our prayers (Yes, No, Wait). Right now I am processing my passport renewal and then my US visa. I know it is still a long way before I would officially say I am going but with God’s first step answer, I am confident to finish this race on time (with sweat—hopefully I would loose weight–eheheh!). “It is sweeter to receive a blessing when it’s done with hard work,” a word (sentence ^_^) of encouragement from my sister Jonah every time I feel down or discouraged with my application.